Former government assassin Toby O'Dare is summoned to fifteenth-century Rome at the height of the Italian Renaissance to solve a poisoning murder linked to an earthbound spirit, a case complicated by dark ecclesiastical plots. "Ghosts and angels aside, Of Love and Evil transcends the metaphysical thriller label through its grounding in historical fact...[Toby’s] sense of wonder proves infectious for the reader as well...[Rice] not only explores a battle against evil, but asks what it means to be evil and who gets to define it. Above all, Of Love and Evil is simply good entertainment." 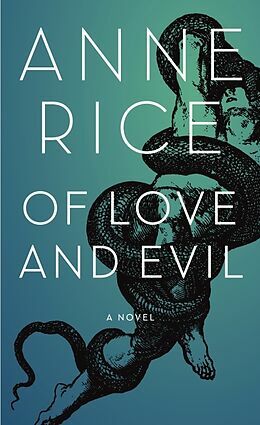 "Rice tells a good story, nicely balancing the profound and the profane." "Rice knows how to tell a story, and this one’s a lot of fun. . . Rice’s knock-your-socks-off cliffhanger ending leaves no doubt that this series has wings." "Rice is remarkable in her ability to breathe life into another place, another time." "Present, as always, is the author’s ability to craft dreamlike prose to lull readers into believing every heavenly scenario she puts forth without a whiff of disbelief." Anne Rice is the author of thirty books. She lives in Rancho Mirage, California. 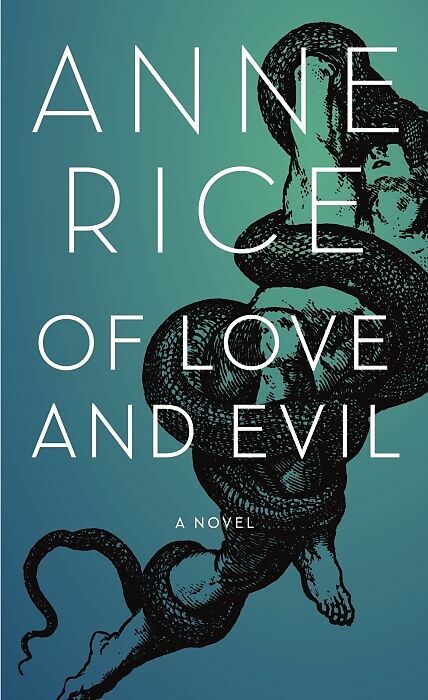 Rice's lyrical, haunting new novel is a metaphysical thriller of angels and assassins that once again summons up dark and dangerous worlds set in times past. Thus begins Anne Rice’s lyrical, haunting new novel, a metaphysical thriller of angels and assassins that once again summons up dark and dangerous worlds set in times past. Anne Rice takes us to other realms, this time to the world of fifteenth-century Rome, a city of domes and rooftop gardens, rising towers and crosses beneath an ever-shifting layer of clouds; familiar hills and tall pines . . . of Michelangelo and Raphael, of the Holy Inquisition and of Leo X, second son of a Medici, holding forth from the papal throne . . .
And into this time, into this century, Toby O’Dare, former government assassin, is summoned by the angel Malchiah to solve a terrible crime of poisoning and to search out the truth of a haunting by an earthbound restless spirit—a diabolical dybbuk. O’Dare soon discovers himself in the midst of dark plots and counterplots surrounded by a darker and more dangerous threat as the veil of ecclesiastical terror closes in around him. As he embarks on a powerful journey of atonement, O’Dare is reconnected with his own past, with matters light and dark, fierce and tender, with the promise of salvation and with a deeper and richer vision of love. I DREAMED A DREAM OF ANGELS. I SAW THEM AND I heard them in a great and endless galactic night. I saw the lights that were these angels, flying here and there, in streaks of irresistible brilliance, and some as great as comets which seemed to draw so close the fire might devour me, and yet I felt no heat. I felt no danger. I felt no self. I felt love around me in this vast and seamless realm of sound and light. I felt intimately and completely known. I felt beloved and held and part of all I saw and heard. And yet I knew I deserved nothing of it, nothing. And something akin to sadness swept me up and mingled my very essence with the voices who sang, because the voices were singing of me. I heard the voice of Malchiah rise high and brilliant and immense as he said that I must now belong to him, that I must now go with him. That he had chosen me as his companion and I must do what he would have me do. How strong and brilliant was his voice rising higher and higher. Yet there came against him a smaller voice, tender, lustrous, that sang of my life on earth and what I had to do; it sang of those who needed me and loved me; it sang of common things and common dreams, and pitted these with faultless courage against the great things which Malchiah sought to do. Oh, that such a mingling of themes could be so very magnificent and this music should surround and enfold me as if it were a palpable and loving thing. I lay upon the breast of this music, and I heard Malchiah triumph as he claimed me, as he declared that I was his very own. The other voice was fading but not conceding. The other voice would never concede. The other voice had its own beauty and it would go on singing forever as it was singing now. Other voices rose; or they had been there all the while. Other voices sang all around me and of me, and these voices vied with angelic voices as though answering them across a fathomless vault. It was a weave, these voices, angelic and other, and I knew suddenly that these were voices of people praying, praying for me. They were people who had prayed before and would pray after and in the far future and would always pray, and all these voices had to do with what I might become, of what I might be. Oh, sad, small soul that I was, and how very grand was it, this burning world in which I found myself, a world that makes the very word itself meaningless as all boundaries and all measures disappear. There came to me the blessed knowledge that every living soul was the subject of this celebration, of this infinite and ceaseless chorus, that every soul was loved as I was loved, known now as I was known. How could it not be? How could I, with all my failures, all my bitter losses, be the only one? Oh, no, the universe was filled with souls woven into this triumphant and glorious song. And all were known and loved as I was known and loved. All were known as even their prayers for me became part of their own glorious unfolding within this endless and golden weave. Not a single word was lost in this great womb of love that surrounded me, this vast night that was as bright as day. For neither day nor night mattered here, and both were blended and all was perfect, and the prayers rising and rising, and overlapping, and the angels calling were all one firmament to which I completely surrendered, to which I completely belonged. Something changed. Still I heard the plaintive voice of that angel pleading for me, reminding Malchiah of all that I was to do. And I heard Malchiah’s gentle reproof and ultimate insistence, and I heard the prayers so thick and wondrous that it seemed I would never need a body again to live or love or think or feel. Yet something changed. The scene shifted. I saw the great rise of the Earth beneath me and I drifted downwards feeling a slow but certain and aching chill. Let me stay, I wanted to plead, but I didn’t deserve to stay. It was not my time to stay, and I had to feel this inevitable separation. Yet what opened now before me wasn’t the Earth of my expectations but vast fields of wheat blowing golden under a sky more vivid in the brightening sun than I had ever beheld. Everywhere I looked I saw the wildflowers, “the lilies of the field,” and I saw their delicacy and their resilience as the force of the breeze bent them to and fro. This was the wealth of the Earth, the wealth of its blowing trees, the wealth of its gathering clouds. And there followed on my whisper an embrace so close, so total, that I wept with my whole soul. The fields grew vague and large and a golden emptiness enveloped the world and I felt love embracing me, holding me, as if I were being cradled by it, and the flowers shifted and turned into masses of colors I couldn’t describe. The very presence of colors we did not know struck me deep and rendered me helpless. Dear God, that you love us so very much. Shapes were gone. Colors had detached themselves effortlessly from shapes, and the light itself was rolling now as if it were a soft and consuming smoke. There appeared a corridor and I had the distinct impression, in words, that I had passed through it. And now, down the long corridor there came to me the tall slender figure of Malchiah, clothed as he always was, a graceful figure, like that of a young man. I saw his soft dark hair, his oval face. I saw his simple dark suit with its narrow lines. I saw his loving eyes, and then his slow and fluid smile. I saw him reach out to me with both arms. It seemed then the other voices sang from their hearts, in protest, in praise, I couldn’t tell. I wanted to hold him. I wanted to beg him to let me stay just a little while more with him here. Take me again into the realm of the lamps of Heaven. I wanted to cry. I had never known as a child how to cry. And now as an adult, I did it repeatedly, awake and in dreams. Malchiah came on steadily as though the distance between us was far greater than I had supposed. The morning sun flooded the windows. The noise of traffic rose from the streets. I was in the Amistad Suite, in the Mission Inn, and I was sitting back against a nest of pillows, and Malchiah sat, collected and calm, in one of the wing chairs near the cold stone fireplace and he said again to me that Liona and my son would soon come. A CAR WAS GOING TO PICK THEM UP FROM THE Los Angeles airport and bring them straight to the Mission Inn. I’d told her I’d meet her under the campanario, that I’d have a suite for her and for Toby—that was my son’s name—and that I’d take care of everything. But I still didn’t believe she’d really come. How could she come? I’d disappeared out of her life, in New Orleans, ten years ago, leaving her seventeen and pregnant, and now I was back via a phone call from the West Coast, and when I’d found out she wasn’t married, not even engaged, not even living with someone, when I’d found that out, I’d almost passed out on the spot. Of course I couldn’t tell her that an angel named Malchiah told me I had a son. I couldn’t tell her what I’d been doing both before and after I met that angel, and I couldn’t tell her when or how I might see her again. I couldn’t explain either that the angel was giving me time to see her now, before I went off on another assignment for him, and when she agreed to fly out here to see me, to bring my son, Toby, with her, well, I’d been in a sustained state of jubilation and disbelief. She was still living with her father, apparently, old Dr. Carpenter, as I had called him back then, and it didn’t surprise me that I had earned his contempt and scorn. I’d crept off with his daughter into the family guesthouse, and never dreamed all these years that she’d had a child as the result. The point is: they were coming. Malchiah went down with me to the front walk. It was perfectly plain to me that other people could see him, but he looked entirely normal, as he always did, a man of my height, and dressed in a three-piece suit pretty much like my own. Only his was gray silk. Mine was khaki. His shirt had a sheen to it, and mine was a workingman’s blue shirt, starched, pressed and finished off with a dark blue tie. He looked to me rather like a perfect human being, his wondering eyes drifting over the flowers and the high palms against the sky as if he was savoring everything. He even seemed to feel the breeze and to glory a little in it. “You’re an hour early,” he said. He nodded as though that was perfectly reasonable when in fact it was ridiculous. “Yes, I do,” I conceded. I should have known this. I felt a little crestfallen but I understood. With embarrassment I thought of how proud I’d been to recount my first mission for the angels. I’d even boasted to The Right Man, my old boss, that I had changed my life, that I was writing about it, that maybe someday he’d find my real name in the bookstores. As if he cared, the man who’d sent me as Lucky the Fox to kill over and over again. Ah, such pride, but then, in all my adult life, I’d never done anything before to be proud of. And The Right Man was the only person in this world with whom I had regular conversations. That is, until I had met Malchiah. And I was left realizing I had some fifty minutes to wait for Liona. Maybe I’d take a little walk, have a soda in the bar, I didn’t know. I only knew suddenly I was happy, and I was. As I thought about this, I turned around, and looked towards the doors of the lobby, but for no particular reason. I saw a figure there, to one side of the doors, a figure of a young man, who stood with arms folded, leaning against the wall, staring at me. He was as vivid as anything around him, a tall man like Malchiah, only with reddish blond hair, and larger blue eyes, and he wore a khaki suit identical to my own. I turned my back on him to avoid his fixed stare, and then I realized how unlikely it was that the guy should be wearing a suit exactly like mine, and staring at me like that, with an expression that was just short of anger. No, it hadn’t been anger. I turned back. He was still staring. It was concern, not anger. He gave me a near-imperceptible nod. A remarkable sense of well-being came over me. My anxiety melted away. I’ve heard your voice! I’ve heard you with the other angels. I was fascinated and oddly comforted, and all of this in a split second. A little crowd of guests came out of the lobby doors, passing in front of this figure, and obscuring him, and as they turned left to go along another path, I realized he had disappeared. My heart was skipping. Had I seen all this correctly? Had he really been staring at me, and had he nodded to me? My mental picture of this was fading rapidly. Someone had been standing there, yes, of course, but there was no way now to check what had happened, to submit it to any kind of analysis. I put it out of my mind. If he was my guardian, what was he doing but guarding me? And if he wasn’t, if he’d been someone else, well, what was that to me? My memory of this continued to fade. And of course, I’d settle the whole matter with Malchiah later. Malchiah would know who he was. Malchiah was with me. Oh, we are creatures of such little faith. An extraordinary contentment filled me suddenly. You are a Child of the Angels, I thought, and the angels are bringing Liona and her son, your son, to you. I took a long walk around the Mission Inn, thinking what a perfect cool California day it was, passing all my favorite fountains and chapel doorways and patios and curios and other such things, and it was just time then for her to have come. I returned to the far end of the walkway, near the doors to the lobby, and I waited for two likely people to start up the path and then pause under the low arched campanario with its many bells. I couldn’t have been there for longer than five minutes, pacing, looking around, checking my watch, moving in and out of the lobby now and then, when suddenly I realized that amid the steady flow of foot traffic along the path, there were two people standing right beneath the bells as I had asked those two people to do. For a moment I thought my heart would stop. I’d expected her to be pretty because she’d been pretty when she was a girl, but that had been the bud to this, the radiant flower, and I didn’t want to do anything except stare at her, to drink in the woman she’d become. She was only twenty-seven. Even I at twenty-eight knew that’s not very old, but she had a womanly manner about her, and she was dressed in the most becoming and most finished way. She wore a red suit, fitted at the waist and flaring over her narrow hips, with a short flared skirt that just covered her knees. Her pink blouse was open at her throat and there she wore a simple string of pearls. There was a tiny bit of pink handkerchief in her breast pocket, and her purse was patent leather pink, and so were her graceful high-heeled shoes. What a picture she was in those clothes. Her long full black hair was loose over her shoulders, with only some of it drawn back from her clear forehead and fixed perhaps with a barrette, the way she’d done it when she was a girl. A sense came over me that I would remember her this way forever. It didn’t matter what would happen next or hereafter. I would simply never forget the way she looked now, so gorgeous in red, with her full and girlish black hair.